Texas hombre chooses "Cold Death"
The third time proved to be the charm as a winner was finally selected for the Gutshot Summer Drawing. The name of the first winner was drawn on June 15, but he failed to respond to five e-mails in two weeks so a second name was drawn. That name had a dead e-mail account. 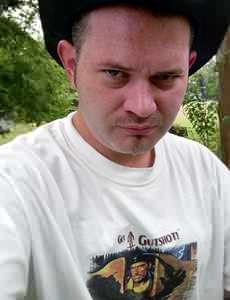 So, the Gutshot Posse went back to the hat full of names and pulled out a slip for Kreg Mosier of Nacogdoches, Texas. LOOKIN' BAD IN "COLD DEATH!" Winner Kreg chose this from the more than 20 items available from the General Store. Go to the Registration Page and you could be our next winner! We think he's giving us his "game face" that says, "don't mess with me, or I'll blast ya!" "Woo-Wee!! I feel luckier'n all get out," Kreg responded when he heard the good news. "I guess I should thank them other fellas for not answerin' the call before me...ha ha!" Kreg is the eighth person to win a prize from the Gutshot General Store since the drawings began in 2002. Like previous winners, he got to select something he wanted from the 21 items currently available. "Well, after perusin' the General Store, I reckon I'd like to get me one of them Cold Death T-Shirts," Kreg said, referring to one of the two shirt styles currently available. Gutshot co-creator Mike Mitchell said he was glad they finally found a winner. "This is the first time that we’ve had to draw more than one name. I was surprised when the first winner didn’t respond," Mitchell said, adding that in the last week he sent a flurry of e-mails to try and reach him. "I was even more surprised when I sent the second e-mail and it came back in two days as being undeliverable. Guess some outlaws must have cut the telegraph wires between here and there." The next drawing will be Sept. 15, 2004. If you haven't done so already, mosey over to our Contest Registration Page and sign up for it. And remember, if you've registered in the past, you don't need to do so again. your name stays in the hat until you win! As with previous contests, the winner will get to pick one item of Gutshot Merchandise from the General Store. The store currently carries T-shirts, baseball caps, a mousepad, a Barbeque Apron, a wall clock, a tile box, a lunch box, and lots of other items that'll make you happier than a 49er hitting a gold strike!